Over the years, several historians and musicians say the Egyptian Maqsoum rhythm is the father of all Egyptian rhythms. Despite this statement may be somewhat exaggerated it is very clear that the Maqsoum has influenced the creation of other rhythms and this rhythm is par excellence the most widely used in Arab music and dance. 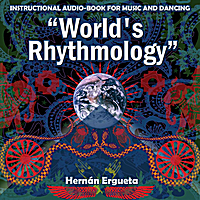 In this audio-book Oriental Rhythms Vol.1, Hernan Ergueta, makes an analysis of various Egyptians rhythms, and other more from distant regions, finding the root that links all these rhythms with Maqsoum. This bond becomes a powerful teaching tool both, for musicians and dancers. As this rhythm is studied, one can easily understand 11 other rhythms that are closely related to it, and one can do this in a really simple way. The Maqsoum rhythms discussed are: Baladi, Saidi, Masmoudi, Maqsoum Walking, Sombati, Shiftatelli, Fallahi, Ayoup, Zar, Bayou and Karatshi.